So how do you do great design in a rapid, multidisciplinary and inclusive way? How do you set up new projects for success in a fast moving, agile environment? How do you ensure shared understanding and ownership of new initiatives in just a few days? I now focus a lot of time on facilitating collaborative design workshops, and other methods focused on quickly creating a shared understanding of objectives and buy-in for and execution approach. In my experience if you set up a new project well a good team can then pick up the ball and run with it. On the other hand, if a project has a wobbly start – with a lack of vision and differing understanding of the objectives – then even the best team can be doomed to failure. So before i bore you to death talking about it, i will start with a timelapse video of a Collaborative design workshop showing the kind of thing i am going to talk about. Below is a photo of the core team discussing the final Sketchboard. Its worth noting that there are also priority and sequencing notes – so its a definintion of both what to build, and how to go about it. 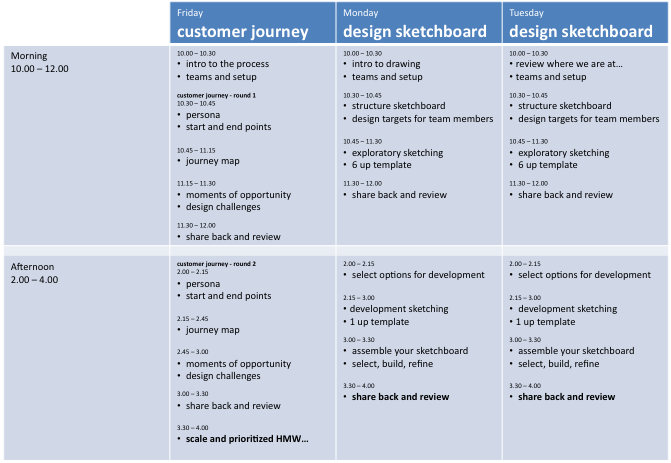 Again, before I smother you with the detail of how to do it, I will start with the typical output of 3-4 days of collaborative design workshops. This example was part of a 2 week build Inception. 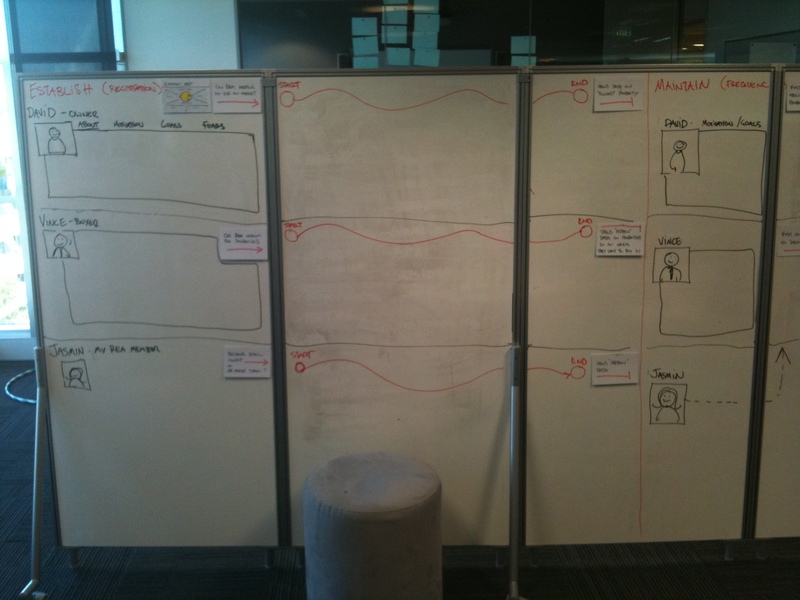 The output was used to drive technical story writing, estimation and planning for agile build phase. a definition of who our customers are, what value we will be delivering to them, and how the business will deliver this value – framing the business drivers / objectives and resource required by the project. exploring typical journey customers will experience when attempting to extract value from our services. Their motivations, goals and fears and how these define “moments of opportunities” in their journeys. Or more simply, “How might we…” add real value for our customers. a way of translating “How might we…” design challenges into design solutions. A sketch based method for rapidly developing and sharing design concepts. 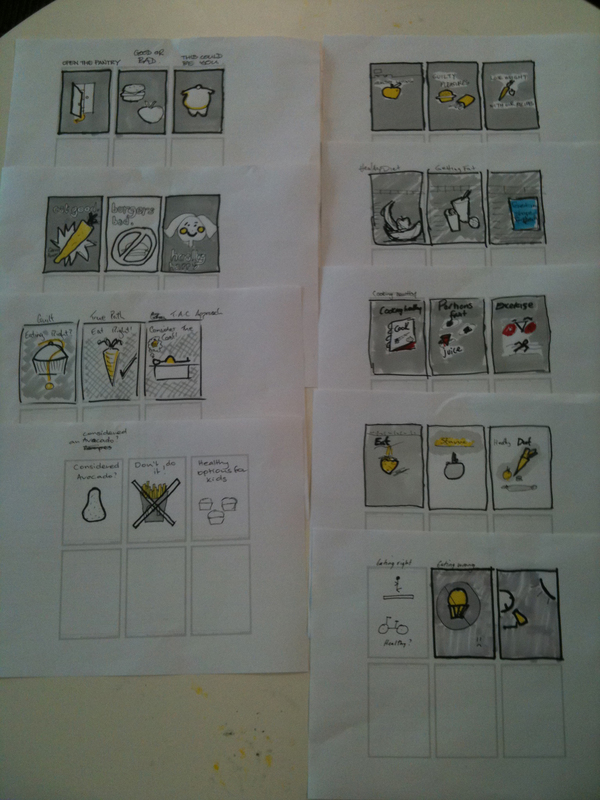 In the end, its the Design Sketchboards that are the real deliverable of these workshops. They represent a great starting point for either writing stories for estimation, or as a clear brief for a UX designer to develop an interactive prototype for customer testing and business validation. If your gathering 10-15 people together for workshops, taking 50% of their time for a number of days then your asking for a big commitment and YOU BETTER HAVE A PLAN! You need to be clear about when they need to be there (i use 2 x 2 hour workshops per day), what process they will go on (sample assets always help) and most importantly a strict and clear shedual of activities and timing for each activity. If your going to work them hard, then you need a whip. Having a plan is the whip. Pre-planning the teams is also a good idea in order to ensure a good mix of disciplines. A sample 3 day workshop agenda is shown below. I use the business model canvas, objective statements and other fairly standard inception activities to drive out a shared understanding of the Business Drivers. If your staring an inception workshop there is a good chance there is someone standing there with a bucket of money and some expectations. Its good to start by understanding what these expectations are. I have posted about the business model canvas before – so wont go into to much detail here. Below is a time-lapse of me facilitating the session. What i think is clear is you need a clear, predefined structure, plenty of wall space and (this is the hard bit) the ability to rapidly make sense of the flow of post-it notes that are developed during the session. I have created a set of cheat cards to help facilitate these sessions. A link to the PDF is available below. Mapping out the customer journey lets you understand the real world experience for your customers, and describes the context within which your service will exist. Below is a timelapse videos of a customer journey session. split into teams and develop personas, motivations fears and goals. We developed our personas using data from previous user testing participants. Translate moments of opportunity into design challenges, and map these onto the journey. In the video these are the white cards above all the post-it notes. You then need to prioritise the “how might we…” challenges and decide which ones you are going to tackle in the next phase. The “how might we…” design challenges are an excellent design brief for the next sketch design phase. The process ensures that you have coverage across the entire journey – not just focusing on one small (and usually hard to implement) part of the application. Design Sketchboards are a place to explore flows, sketch ideas and collaboratively build up a vision for the experience design for key area’s within the service. I was first introduced to this way of working via Leah Buley and Brandon Schauer from Adaptive path. Much of what i describe below is based on their method, as are the 1 up and 6 up templates. As the name suggests it requires people to sketch. Now you may think this is challenging for some people, but all you need to do is give them the right tools and train them up a bit. If you can sprinkle UX’ers or other people you know who can draw around the teams it helps. Again, i have Adaptive path / UXweek 2010 to thank for reminding me about getting back to basics with drawing. There was a time when i simply thought sketching was a waste of time (i could do it a thousand times quicker in fireworks, and generate interactive prototypes really quickly) BUT what I missed is the shared, team aspect that getting everyone to draw brings with it. to warm up start with drawing boxes, then move to practising drawing some fictional website homepage. Below is a timelapse video of setting up and using a Design Sketchboard. Select and build on the best approaches together. Its worth taking some time after sharing back to clean up and restructure the Sketchboard in preparation for the next round of design. its worth noting that we brought in a end user (stole them from some user testing) and i got each team to present their designs. I was a very health check point and forced the teams to clarify what they were trying to do, and to quickly find a way to express it. I hope this helps you in some way. I have run a few of these sessions and while exhausting they can be very effective and the tech and business people love them. Once you stop working in isolated “expert” mode (the default for most UX’ers), and start working collaboratively its hard to turn back. Its simply a more effective, faster and more satisfying way to work. Thanks, Jason! The combination of text and video is a nice way to communicate how this type of Inception workshop should go. Thanks you so much for taking the time to note all your steps. The videos are great to see the interaction happening. I’m definitely going to try this out. Wow, this is fabulous! Many thanks for sharing, and so elegantly too! Were the teams doing parallel designs or were they working on different problems? Would like to observe one of these in practice or perhaps run a workshop internally. Nice one Jason. Just ran an inception with the business model canvas which help ground decisions back to real customer and business value. The business model should always be in flux in the first week and continue to play a crucial role during the inception where personas, user journeys, wireframes evolve and change whilst fine tuning the value proposition. Thanks for the inspiring post Jason! I led a one day Design Studio at my company and used this post as reference. I’m in the process of writing up a post about how it went and some take-away lessons to make the next one better. Will post a link here when I do. Jason, thanks again for brilliantly leading our recent collaborative design workshops (at REA Group). You’re a ‘gun’, and it’s been our pleasure to have you with us. We’re really happy with the way this process: (i) brought the best minds and ideas to the table from across the business; (ii) quickly galvanised around the most promising experiences; and (iii) produced a set of tested, top-shelf designs that will now enter our Agile build phases. We’re now cementing and evolving this set of design processes (together with building up a 5+ personnel ‘Experience Design’ team) into ‘the way we work’ at REA Group – so we can scale these results across all of our key site and product initiatives. If you’re a brilliant Experience Designer (with a strong background in UX, and preferably some digital design experience), and want to work in Melbourne with a passionate Marketing and IT team to shape the future of one of Australia’s biggest dot coms (REA Group, capitalised at $1.5B, 10M monthly UBs, operating in four countries), email us your linkedin profile and some portfolio work. We’re looking for a Head of Experience Design, 2-3 Senior Experience Designers, and 2 Digital Designers. If any of these roles sound like you, we’d love to chat. 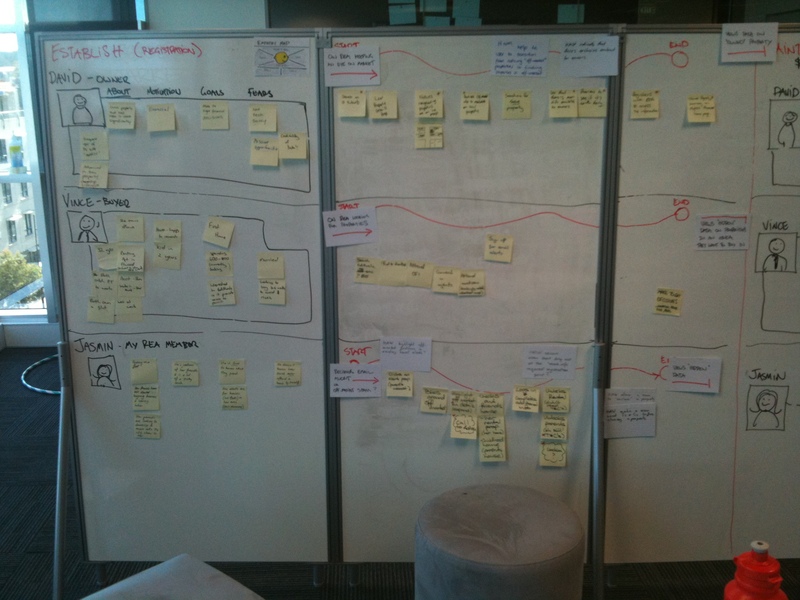 Pingback: Resolving the tension between the creative exploratory process and Agile Leanness « Melbourne, as in the city. Generally, I support the majority of your views in this post but don’t agree with your statement: “… isolated “expert” mode (the default for most UX’ers)”. In my experience, this is NOT the default view of most UX’ers. The default view is to take a holistic UX view – collaboration and co-design in my experience. 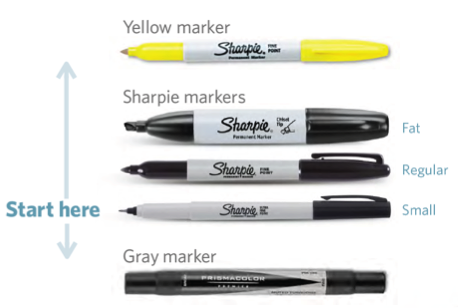 One question: What model & brand of portable whiteboards are you using ? And are you happy with them ? You can earn much more with their free affiliate program. penny as a result of lack of correct direction. Associated Content – This is considered one of my personal favorite sites to make money online all you’ve got do is subscribe and write articles they are often about anything that you would like to write about. Pingback: Finding time for the creative exploration process within Agile software delivery | Melbourne, as in the city. This looks like a great exercise. Would love to try this out myself. And I have never used Sketchboard. Looks like a good tool. Just start playing with Paper53 myself (it’s nice for simple drawing and quickly posting). Thank you, this is great. I would have preferred to see videos with sound that show snippets of the actual process. I don’t find the time lapse format valuable in this context. Still, great information. Thanks again.